Boneyard Camo™ is not your ordinary camouflage company. Along with a full lineup of concealment patterns that utilize “Confusion Technology” to hide the user’s outline, they are also paving the way with their innovative camouflage Designer Series. Boneyard’s Designer Series is comprised of many unique patterns and is home to their Legends™ Camo, a vastly popular deer skull, and antler camouflage. 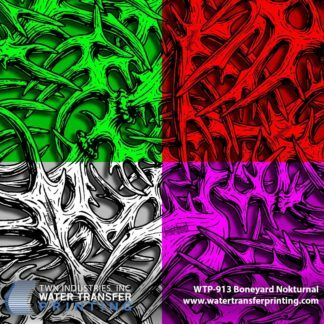 Boneyard Nokturnal is the newest addition to Boneyard Camo’s designer camouflage series. Nokturnal features unique etched antler imagery with a shadowed background and transparency in the antlers. This selective transparency allows you to create one-of-a-kind, vivid designs by customizing base coat colors and experimenting with gradients. Additionally, the background shadowing in Nokturnal provides enhanced depth and contrast. We captured the process of decorating Scott Boerner’s – President at Boneyard Designs, LLC bow in the new Boneyard Nokturnal pattern. The process included a tri-colored gradient that faded from orange to metallic gray, to gunmetal. Check out the video to gain some inspiration for your next Water Transfer Printing project! Nokturnal was created by hand with nothing more than pen and ink. The antlers are etched and overlap over one another to create an elaborate designer camouflage pattern. 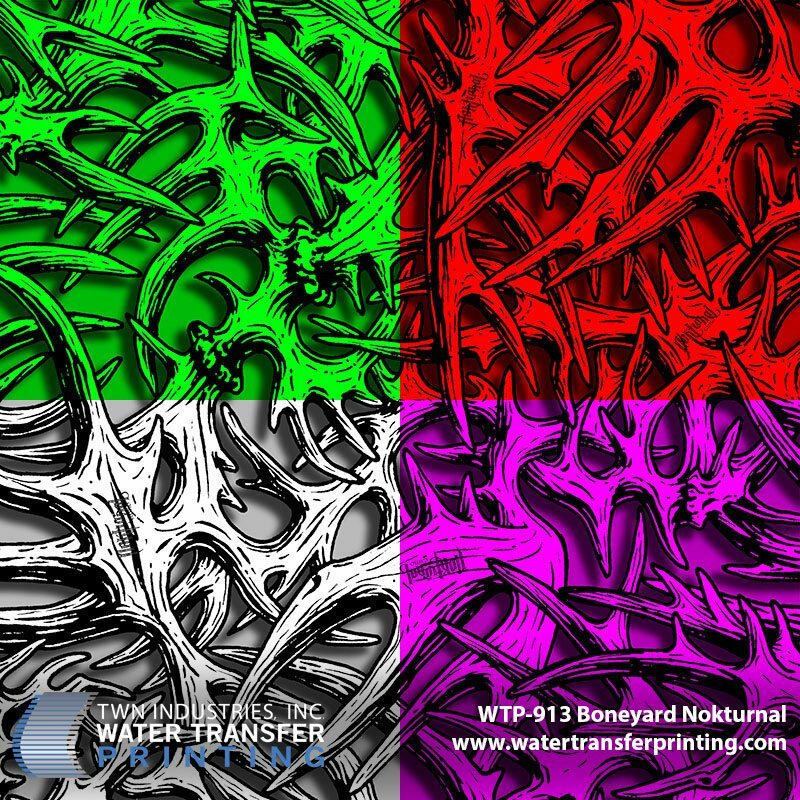 The idea behind Boneyard Nokturnal was to illustrate antler shapes in a very “Non-Typical” way (pun intended). Boneyard Camo created this pattern to cater to deer hunters and antler fanatics. Rifles, knives, and other hunting accessories. Coolers and Stainless Steel Tumblers. Boneyard Camo started in 2008 with a pattern called “NonTypical”. It was produced in the Water Transfer Printing market and eventually made its way onto sunglasses and other consumer products. Later, Boneyard designed Legends Camo, a unique designer camouflage featuring deer skulls, antlers, and a high definition bark/brush texture. This put Boneyard Camo on the map as Legends was perhaps the first antler camo to make it to the mainstream marketplace. Boneyard Camo is a creative powerhouse that offers the public unique ways to express their hunting heritage. Although they make camo patterns for concealment, they believe traditional “stick and leaf” patterns have a place and it’s not on hard goods! Thus, they strive to design and develop new innovative camouflage patterns that exemplify their passion for hunting and fishing. Learn more about Boneyard Camo at https://boneyardgear.com/.